A roundup of business news from the week of July 8-14. Bath Iron Works’ second Zumwalt-class stealth destroyer, the $7.5 billion USS Michael Monsoor, needs a $20 million engine replaced because inspectors found damage after the ship’s naval acceptance trials. The Monsoor must have a main turbine engine replaced before the ship can sail to San Diego for its combat system activation, according to a Naval Sea Systems Command spokeswoman. The engine was made by Rolls-Royce and installed at BIW in Bath, where the ship is currently docked. The Navy is preparing to remove and replace the engine with a spare, she said. Upon removal, the engine will be inspected to determine the root cause of the damage, and then it will be refurbished. The Navy is working closely with Bath Iron Works and Rolls-Royce to get the damaged engine replaced before the ship leaves Bath this fall and sails to San Diego to begin having its weapons systems installed next year, according to the U.S. Naval Institute news service USNI News. Read the story. Portland-based ImmuCell Corp. says it has caught up with a backlog of product orders after a weak first quarter, leading to a big sales boost in the second quarter. ImmuCell, which develops, manufactures and markets products that improve the health and productivity of dairy and beef cattle, released preliminary sales results for its second quarter, which ended June 30. The preliminary sales report says ImmuCell sold over $3 million worth of its flagship product, First Defense, in the second quarter. That figure represents a 72 percent increase over sales of about $1.8 million a year earlier. Read the story. After weeks of stalling, Gov. Paul LePage has finally authorized the sale of $117 million of voter-approved bonds meant to pay for a variety of projects, including $80 million for highway projects currently underway. LePage previously had stalled the sale of bonds in a dispute with the Legislature over state borrowing and a package of new spending bills. But on Thursday, LePage Press Secretary Julie Rabinowitz confirmed that the governor signed documents to authorize the bond sales. LePage spokesman Peter Steele said Monday that the governor was concerned about “eleventh-hour legislative spending” and was asking State Treasurer Terry Hayes for additional time to consider signing off on the $117 million borrowing package. LePage later said the bonds were being held up because he didn’t have all the information he needed from Hayes. But Hayes produced documents showing that LePage had been kept up to date until his final signature was needed to authorize the bond sales. Read the story. Portland is preparing for the end of high-speed ferry service to Nova Scotia. Bay Ferries Ltd., the company that has operated the service for the past three years, is expected to unveil a proposal next week to restore a town-owned ferry terminal in Bar Harbor and restart service from there to Yarmouth, Nova Scotia. If that happens, the company plans to eliminate its service from Portland. 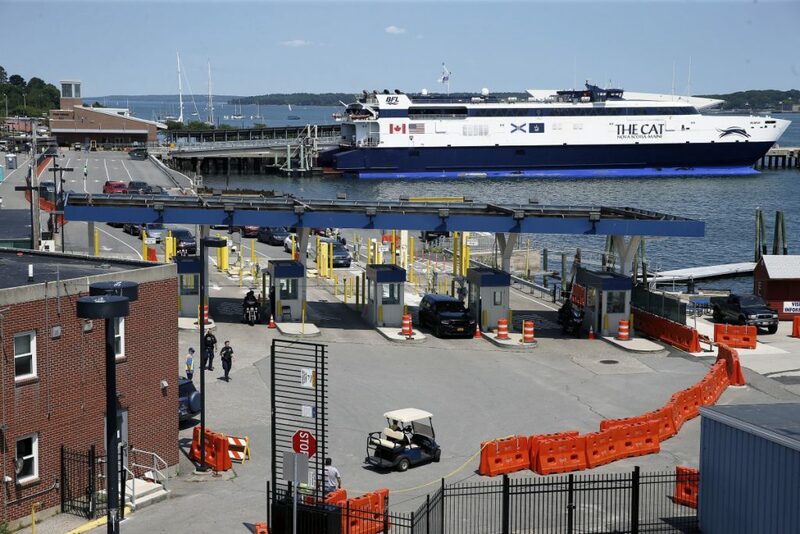 The loss of the high-speed ferry, called The Cat, means people from the Portland area and south would have to drive at least three more hours to board a ferry for Nova Scotia. But Portland officials say the ferry’s departure would open up opportunities for waterfront development. Read the story. Fishing groups are divided over what a proposed update to the nation’s marine fishery management law would mean for Maine. Some groups worried the Magnuson-Stevens Act reauthorization approved Wednesday by the U.S. House of Representatives would hurt efforts to rebuild Maine’s cod, haddock and scallop fisheries, while others say giving regional councils flexibility to decide what kinds of science they will use to guide their decisions could help rebounding fisheries and fishermen. The bill includes an amendment submitted by Maine’s congressional representatives that would help pave the way for lower federal inspection fees, and wait times, on lobster sales to Europe, which despite China’s growing demand still accounted for 31 percent of U.S. lobster shipments abroad in 2017. Read the story. The Falmouth Town Council decided not to allow a zone change that the developers of the proposed Falmouth Center said they need to ensure the viability of the project. Instead, councilors on Monday said they’d prefer to follow a master planning process, while acknowledging that will only be possible if the developers are willing to comply. Developer Jonathan Cohen, who purchased the Falmouth Shopping Center this past spring along with Joseph Soley, could not be reached to comment on the council action. But in prior interviews and public meetings, Cohen has said the zone change from Business Professional to Village Center-1 is necessary to accommodate the Seacoast United athletic organization, which wants to build two outdoor turf fields and an indoor facility. In addition to the sports complex, which Cohen has called a key anchor, the project proposes a hotel, residential housing, retail shops and offices, restaurants and a village green. Read the story. A group hired to investigate complaints about significant increases in the winter bills of many Central Maine Power Co. customers will expand its probe to examine how well the company responded to those complaints. The Maine Public Utilities Commission on Tuesday authorized Liberty Consulting Group, the Pennsylvania company hired to investigate CMP, to expand its audit to include the company’s customer service and communications in addition to the billing and metering issues raised after tens of thousands of customers saw their monthly bills increase significantly. The commission is currently conducting its own investigation of CMP’s metering, billing and customer service performance, in tandem with the Liberty audit. Liberty staff has “considerable expertise” with customer service and the company says it can broaden the audit without affecting its work schedule, said PUC Chairman Mark Vannoy. Read the story. Maine lawmakers overturned Gov. Paul LePage’s veto to pass a sweeping medical marijuana reform bill Monday. The House voted 119-23 and the Senate voted 25-8 to override the Republican governor’s veto and adopt legislation that will allow patients to use marijuana if a doctor deems it medically beneficial, grant six new medical dispensary licenses, permit caregivers to expand their business operations and give the state and municipalities more power to regulate them. The bill will become law 90 days after the end of the legislative session. Read the story. Maine lawmakers have enacted a bill to extend the life of a controversial economic development program that has created hundreds of tax havens for businesses in Maine. The Pine Tree Development Zone program was set to expire at the end of this year, but its expiration date has been extended by three years to Dec. 31, 2021, and additional reporting requirements have been added for the estimated 200 businesses that benefit from the program statewide. Under a sunset provision written into the law that created the program, all benefits would have ended in 2028, but that date has been extended to 2031. The bill was enacted Wednesday without the signature of Republican Gov. Paul LePage, who had sought a longer, five-year extension of the program. Read the story. The latest PricewaterhouseCoopers MoneyTree report on venture capital investment in Maine shows two deals involving a total cash investment of $2.7 million in the second quarter. The largest deal was for a seafood company in Auburn called Cheating Gourmet Foods, which received a venture capital investment of $2.2 million from Arbel Growth Partners of Milwaukee, according to the report issued Thursday. The other deal involved a Biddeford company called Junora LTD that produces advanced metallurgical products for the vacuum coating industry, which uses vacuum conditions to deposit thin coatings on various materials. Junora received $500,000 of venture capital from Brunswick-based CEI Ventures, the report said. Read the story.